This wonderful moment in spring, when the sun shines and before the leaves appear on the trees, is the time when carpets of flowers appear on the woodland floor. 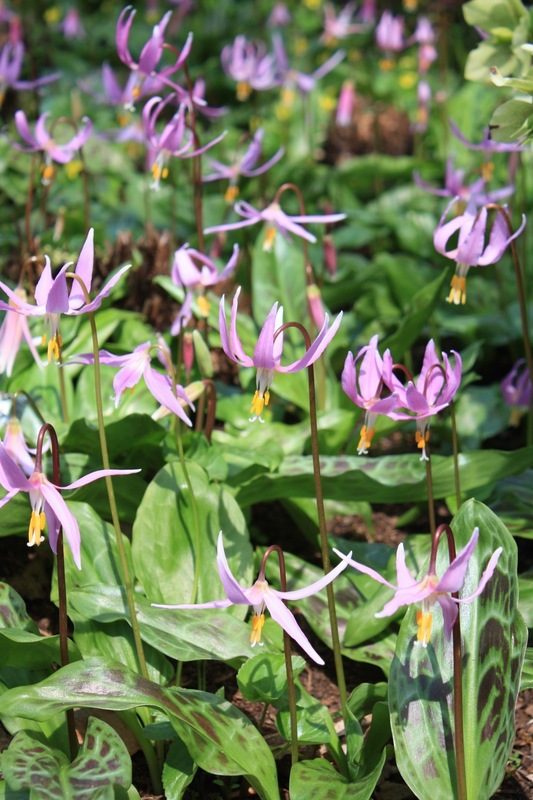 In the UK, we look forward to delicately scented bluebells and virginal wood anemones, but on the west coast of North America, from Northern California to British Columbia, the moist forests are full of Erythronium revolutum, the mahogany fawn lily. With flowers like pink shooting stars hovering above prettily mottled leaves, erythroniums are wonderful little bulbs for deciduous woodland or lightly shaded stream-side gardens. This photograph was taken at the weekend in the Savill Garden, Windsor Great Park. The most glorious moment of the spring for me – such a beautiful trout-lily! And here I also found symphytum iberium which saves Spring. It loves wet feet and shade in my BC garden where it is seldom seen…. Yes, a very useful little plant. We’ve got some decent weather here in the UK …… at last. Thank you for taking the time to comment.